This house is located in Ponte Caldelas and sleeps 8 people. 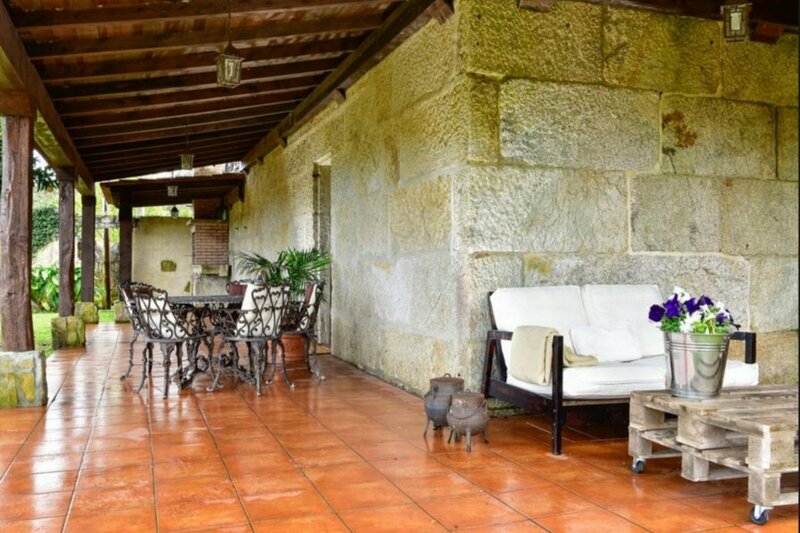 The house in Ponte Caldelas, Pontevedra, has capacity for 8 people and has 3 bedrooms and 3 bathrooms. The accommodation is 350m2, fully equipped and cozy, is located into a well comunicated neighborhood and rural. The accommodation is equipped with coffee maker, kettle - water boiler, microwave, oven, refrigerator, Toaster, juicer, dryer, washing Machine, terrace, radio, alarm, toilet, deposit to be paid upon arrival time, DVDplayer, bathroom with shower, balcony and playground. It is located 20 Km from the Stone beach Varias, 2 Km from Golf course Playa Fluvial Pontecaldelas, 2 Km from Supermarket Pontecaldelas, 35 Km from Airport Aeropuerto de Vigo, Peinador and 16 Km from Train station Estacion de Pontevedra. It has Lake View, Views of the ski slope and Harbor views. Extra charges (to be paid on arrival): Security deposit: 150 Euros and Heating: 2 Euros/kW.